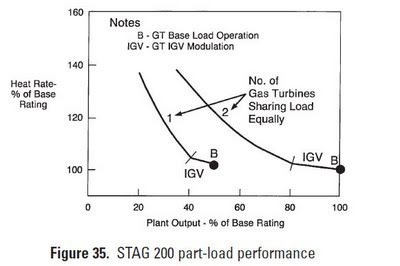 Climate and Stuff: Efficiency of power plant operating below capacity, start up times etc. 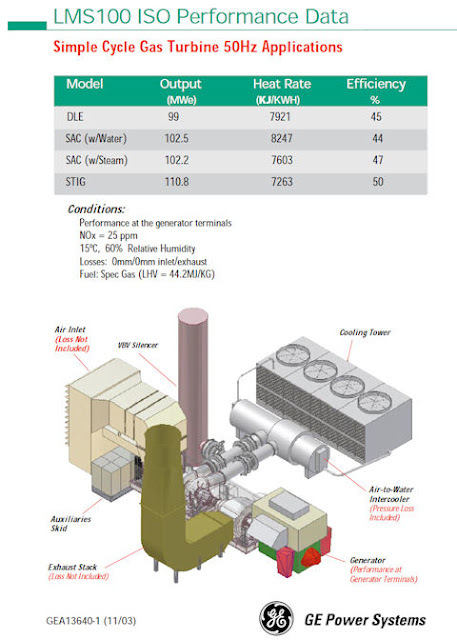 First a combined cycle gas turbine - not known for its efficiency at less than 100% of rated output. 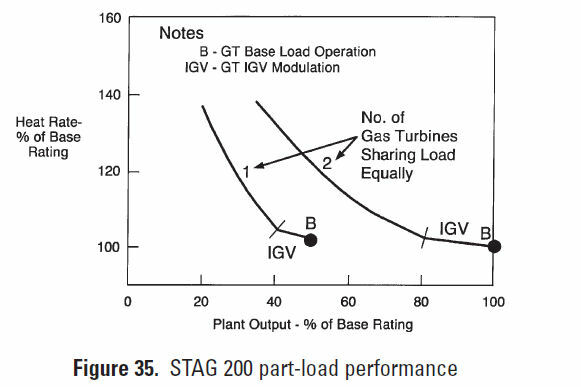 Fast starting and loading is characteristic of STAG combined-cycle generation systems. 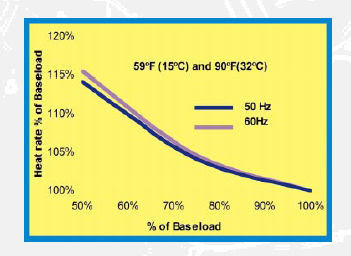 This enables them to operate in mid-range, with daily start peaking service as well as baseload. 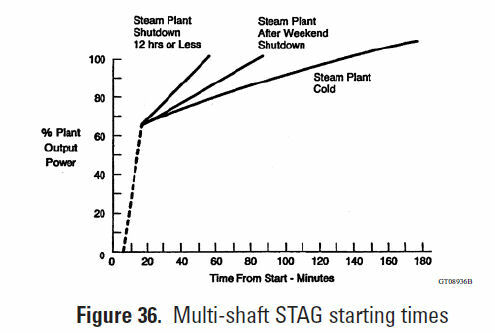 Typically, STAG systems can achieve full load within one hour during a hot start and within approximately three hours for a cold start. Multi-shaft STAG systems allow the gas turbines to start independently of the steam cycle and provide about 65% of the plant capability within 15–25 minutes, depending on the size of the gas turbine, for hot, warm, and cold starts, as illustrated in Figure 36.Single-shaft STAG systems are started and loaded to full capacity in about the same time period as the multi-shaft STAG systems. 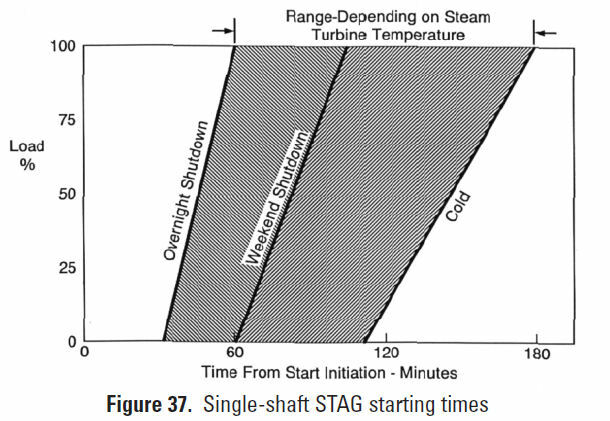 The startup sequence and load profile for the single-shaft systems differ because the gas and steam turbines are started as a single integrated unit and not as two separate units. Single-shaft STAG startup is illustrated in Figure 37. 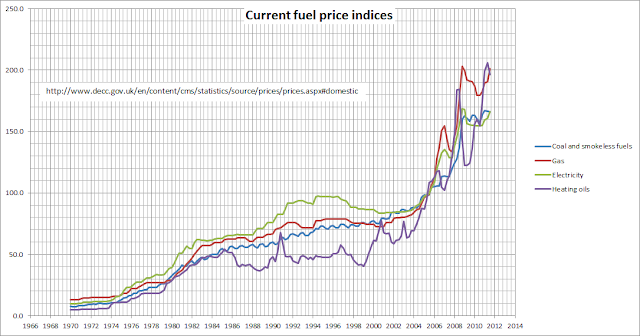 From the House Of Lords. 102. As the amount of wind generation rises, the potential short-term change in wind output will also increase, and National Grid will have to hold more reserve to cope with this increase. The company told us that if renewables provided 40% of electricity generation—the share the company believes would be needed to meet the EU's 2020 energy target—its total short-term reserve requirements would jump to between 7 and 10 GW. Most of this would be standing rather than spinning reserves. This would add £500 million to £1 billion to the annual cost of these reserves—known as balancing costs—which are now around £300 million a year (Q 293). This is equivalent to around 0.3 to 0.7 pence per kWh of renewable output.